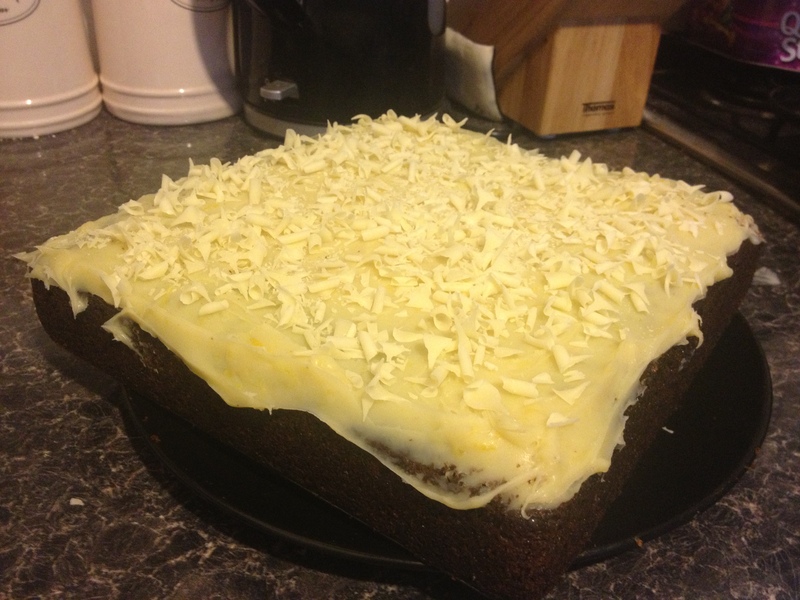 Earlier this month (a few days back, really) I posted about the delicious Lime Drizzle Loaf I made for my Easter shindig. 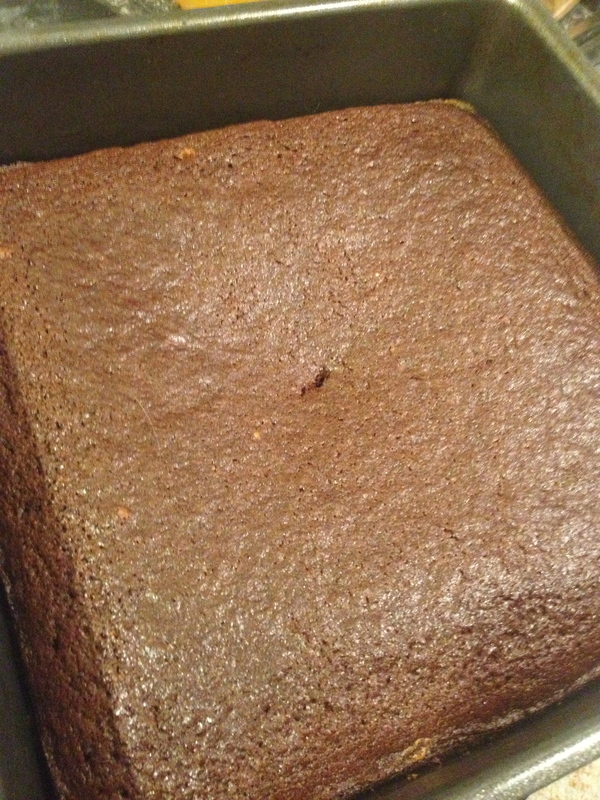 Not more than a week later, and actually around the time I was writing up the recipe, I made the cake again but with lemons, for my mother’s birthday cake. It went down a treat. It’s really easy to substitute Lemons and Limes in recipes to change them to your personal preference, or what you have in the kitchen at the time. A good sized lime is approximately half the size of a lemon, so if a recipe calls for the juice of a lemon, you’d need the juice of two limes. If your limes are particularly dinky (I’m looking at you, three lime net baggies from the supermarket) you may need to stretch to two and a half. Same goes for zest. If you are looking for a citrus hit, lemon is the classic go to fruit, but I think limes have a much tarter and more complex flavour, so I highly reccomend switching it up from time to time. Also, fresh lime zest is the prettiest shade of green and looks fab. Once baked inside a cake it greys out a little, but it’s still eye catching. Sorry tee-tollers; this post is not going to be for you. 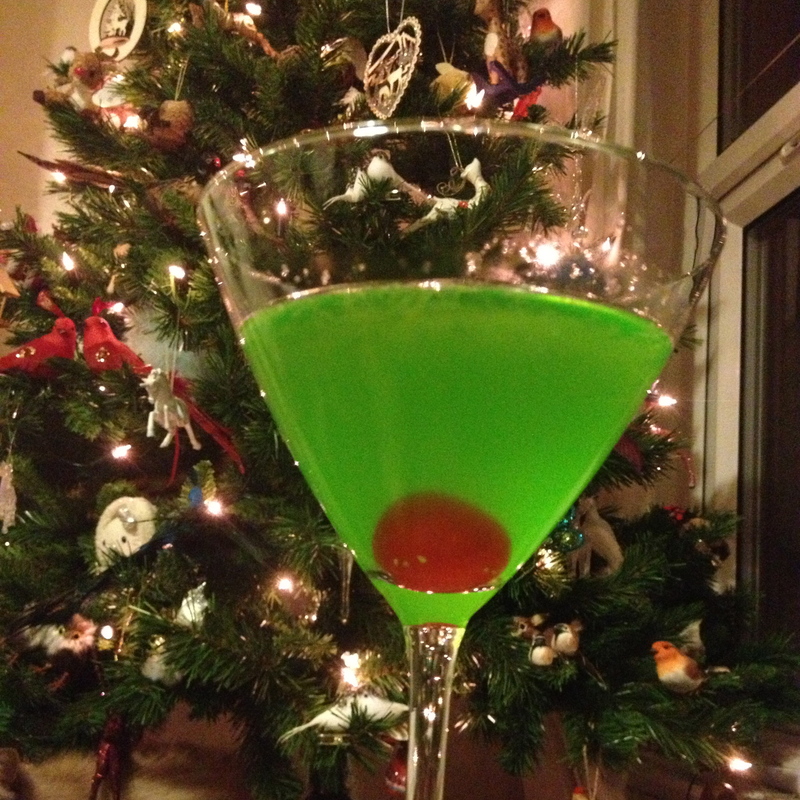 I like my Christmas ‘merry’, and for me there is nothing so festive as a swanky Christmas cocktail party. Not that I get invited to too many of those, but an evening under the Christmas lights, martini glass in one hand and wrapping paper in the other does me just fine. I like my cocktails fruity and sweet, so this ‘menu’ leans quite a bit that way. Some are long, most are strong, but all are instant festive favourites and I just know you’ll love getting ‘jingled’ on them as much as I do. I dedicate this post to Simon, Davi, Pam, Amber, David, Gary, Holly and Izzy, who dutifully ‘tested’ these out for me over the weekend. 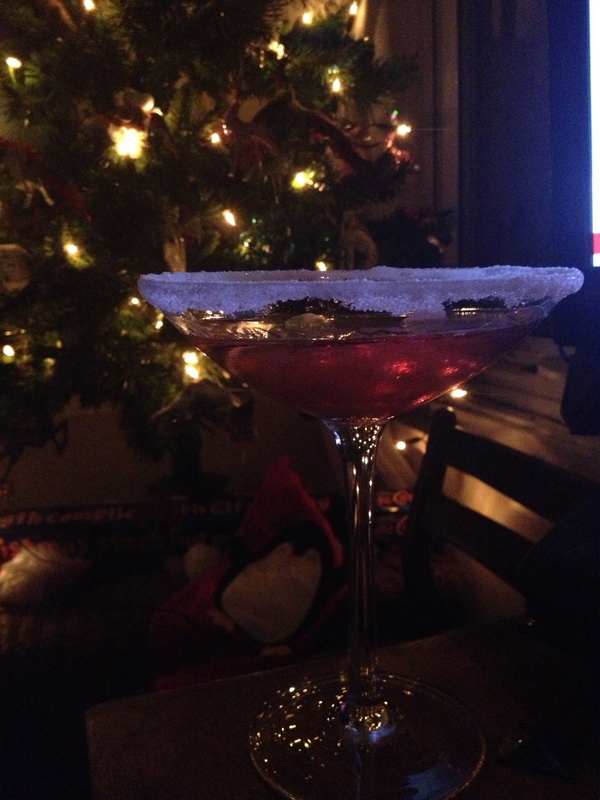 For a ‘martini’, this isn’t the strongest drink around, but it is so tasty and festively red. I adore it. If you really can’t get hold of creme de cacao you *can* use a sweet clear liqueur like Malibu, but I really recommend getting yourself a bottle of this stuff. One, you’ll need it for another recipe later on. Two, you deserve it. Three, it isn’t too difficult to find- a well stocked drinks specialist/off license should have it, or try amazon or thedrinkshop.com. Add ingredients to a shaker and shake over ice. Serve in a martini glass with a glacé or maraschino cherry garnish. If you like your drink a little longer, use two measures of cherry juice. I love love LOVE this cocktail because it is such a step away from the usual christmas flavours, whilst still being pretty darn festive, colour accurate and refreshingly delicious. Shake ingredients over ice and serve in a cocktail glass. Garnish with a glacé or maraschino cherry. 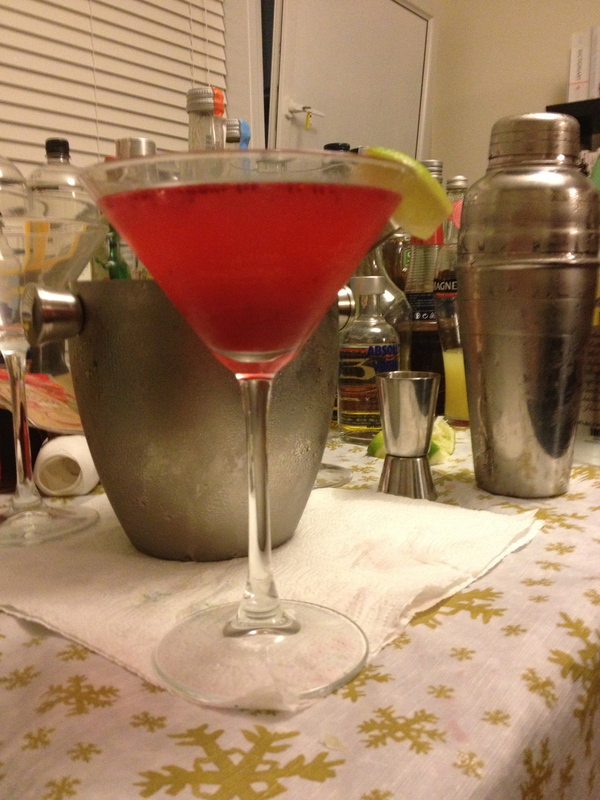 For extra cheer, wet the rim of your glass with the rind of the lemon and rim it with coloured sugar- I recommend red. This fruity, oh-so-red holiday favourite is a great pitcher drink for parties, but here are the measurements for just one glass… if you can restrain yourself to that. There is debate on the the orange liqueur to use, and the sparkling wine, but for me it has to be Cointreau, and I’m not fussy on the wine. White or pink, Champagne or reasonable-but-drinkable plonk- I don’t think you need to go all out on a wine you are using in the mix. If you can drink it on its own, you’re doing it right. If you’re breaking the bank to buy a bottle, you’re doing it wrong. 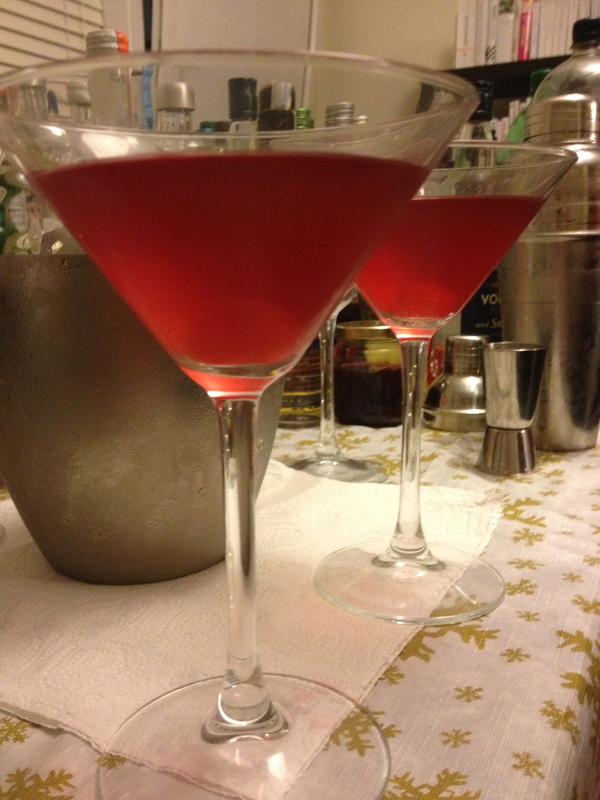 Pour the Cointreau and chilled cranberry juice into your champagne flute and stir well. If the juice isn’t chilled before hand, use a shaker full of ice to bring the temperature of it and the liqueur down. Top with the fizz. There are lots of versions of a Black Forest or Chocolate Raspberry Martini, but this is my favourite. I find this recipe irresistibly festive and delicious, so I’ve included it. Because I love you and I want you to get proper merry this season. This one is really very strong- you have been warned. Add all ingredients to a shaker and shake over ice. 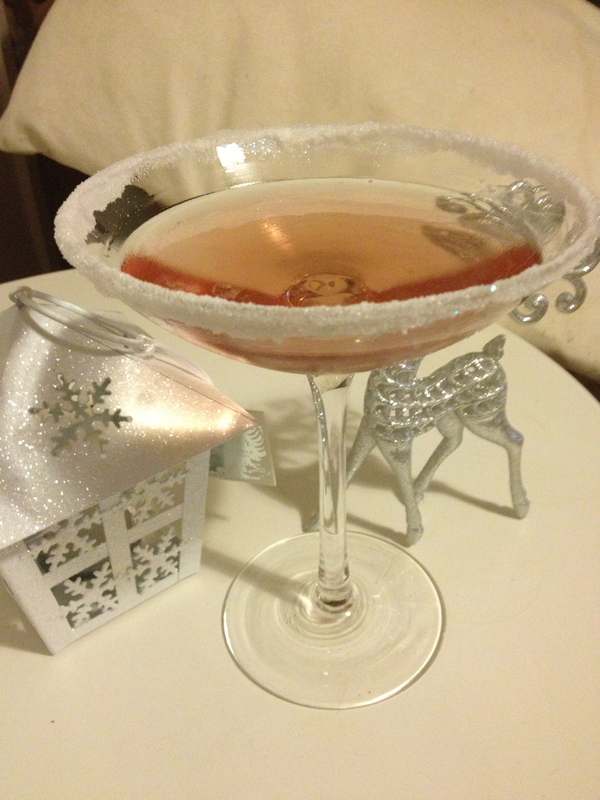 Serve in a cocktail glass rimmed with sugar and confectioners glitter, like a touch of hoarfrost. Beautiful and delicious. I saw this fun and, essentially, frugal take on a Cosmopolitan on Mamrie Hart’s genius Youtube show ‘You Deserve a Drink’. If you’ve got some Cranberry Sauce that needs some love, fix yourself one of these. Please note that I’ve erred on the side of, erm, caution with these measurements. Add all your ingredients to a shaker and shake thoroughly over plenty of ice. Strain and serve in a martini glass with a slice of lime to garnish. After one of each of those you’ll probably be a little worse for wear, so please remember to drink responsibly, particularly around this feast season: you shouldn’t let anything spoil your celebrations. That aside, the above concotions also make an excellent cocktail menu if you are planning a christmassy party- try writing or printing them up in a calligraphy style font to set out for your guests to order from or serve themselves with. I’ll see you again on the 10th with another recipe. 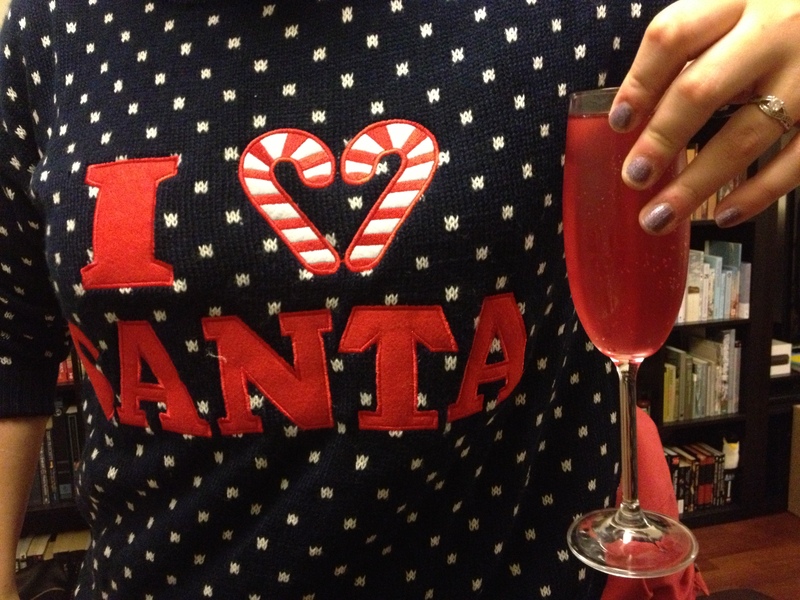 Have a Merry-in-more-ways-than-one evening, everyone!